The tree reaches a height of 23 to 50 m. The bole is straight, but not always cylindrical. The trunk diameter attains 50 to 120 cm. Scottellia klaineana is found in evergreen rain forests, often in small stands and along banks of streams. West Africa from Liberia to southern Nigeria. Wood diffuse porous. Vessels in radial multiples of 2 to 4. Tangential diameter of vessel lumina 100 micras or less (very small). Non-vestured pits. Vessels per mm2 more than 20 (very abundant). Scalariform perforation plates with 5 to 15 bars. Vessel-ray pits Axial parenchyma absent or extremely rare, non visible with magnifying glass (8x). 4 to 10 rays per mm (medium). Rays non-storied. Larger rays more than 4 seriate. Prismatic crystals in the ray cells. Heterogeneous rays and/or multiseriate heterogeneous rays. Septate fibers present. Fibers with simple to minutely bordered pits. 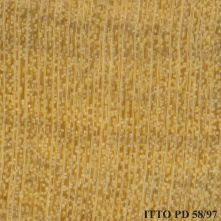 The heartwood is pale yellow to brownish yellow, it is not demarcated. The silver figure is fine. Straight or slightly interlocked, sometimes with an influence on further processing operations. 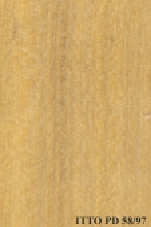 This wood is commonly of moderate luster. Not durable; important risks of decay attacks at any processing step, from logs up to final products. It must receive preservative treatment. Sensible to termites attack. The heartwood is sensible to Lyctus attacks. No residual stresses are reported in this species. Easy to treat with a full penetration of the preservative products using vacuum-pressure method. Ease of Drying: Drying is moderately difficult to difficult; special care is systematically needed. Drying Defects: Risks of distortions. Kiln Schedules: Schedule proposed as a reference by comparison with well known species taking into account to the general technological behavior of this species. Suitable for slicing, also suitable for peeling if treated. Slight blunting effect; ordinary tools can be used for sawing and machining. Machining of this species is reportedly easy.